Assassin's Creed Odyssey is an epic, historical RPG that uses elements of Assassin's Creed to tell a different kind of origin story, and the results are stunning in almost every way. After taking a year off in 2016, the Assassin’s Creed franchise came back with a bang last year with Assassin’s Creed Origins, which, as the title explains, explored the beginnings of the Brotherhood of Assassins, taking the player to ancient Egypt to witness the genesis of the long war between the Assassins and the Templars. The game was a hit with both fans and critics, as the addition of RPG elements to the series’ core gameplay created a masterpiece of an open world game. 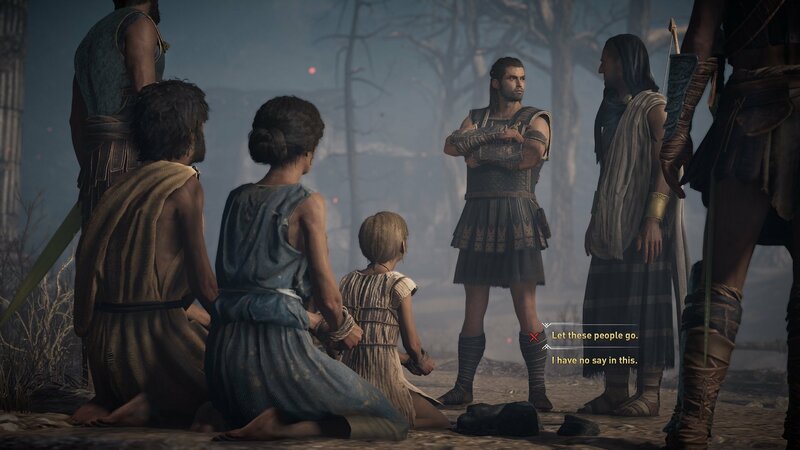 Now, Ubisoft has expanded on that idea further with Assassin’s Creed Odyssey, which mirrors the gameplay of Origins, but puts less emphasis on the Brotherhood vs. Templars story and more on history itself. Whereas Origins was an Assassin’s Creed game with RPG elements, Assassin’s Creed Odyssey is an RPG with elements of Assassin’s Creed. 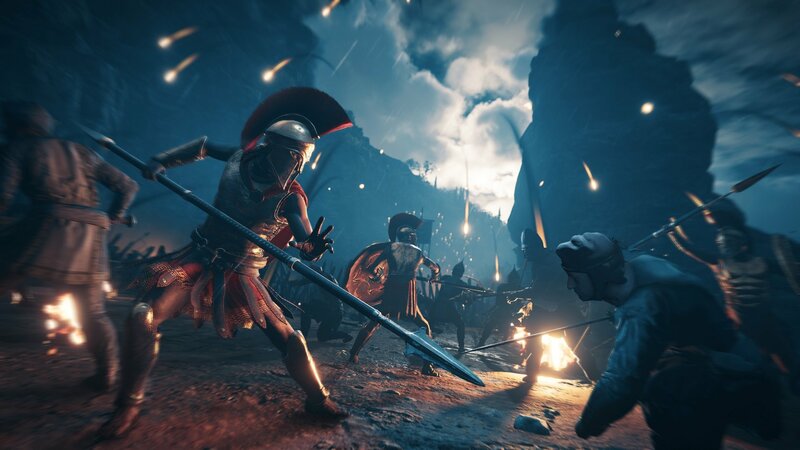 The story follows the journey of a child of Sparta, either Alexios or Kassandra — the player chooses one — as they work as a misthios, or mercenary, and traverse the huge map of over 40 major locations around ancient Greece, completing quests, collecting loot, and upgrading the character. I chose Alexios as my character, so, going forward, I’ll be using his name and the male pronoun throughout this review. 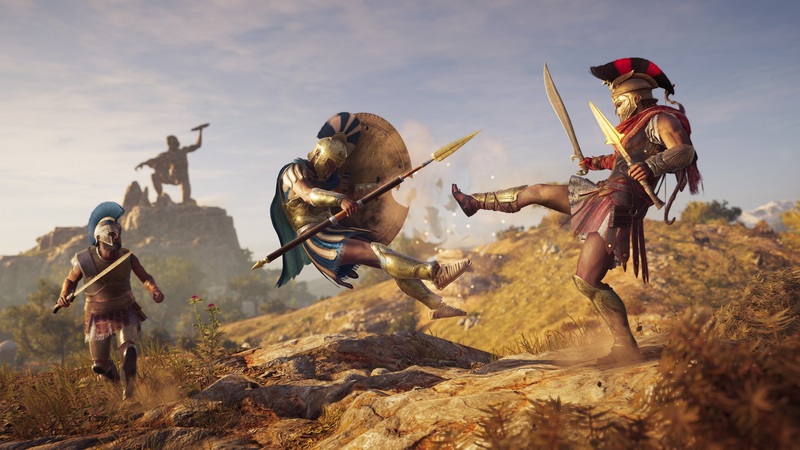 Developer Ubisoft Quebec included player choices in Assassin’s Creed Odyssey. As the player moves forward in the game’s story, certain choices appear, and these decisions have long-lasting effects on the rest of the game. Early on, I came upon a village ravaged by the plague and a group of priests about to kill a family of four. The family begged for my help to free them, but the priests explained to me that the family is sick — something the mother even confirmed — and ultimately, I let the priests carry out their gruesome task. Later, I learned from a promotional video that if I had killed the priests and let the family live, the entire island would have been wiped out by the plague. Four people died so that hundreds could live. Your choices matter. And this is but one example of the crushing weight of these choices. There are many more that carry consequences, and can even affect which of the game’s nine endings you get. The choices are presented in conversations, with multiple dialogue options that move the conversation forward. Little symbols next to certain lines will hint at in which direction the choice will go, including a fight, a balanced outcome, and even a romantic option. Dialogue also helps the player unlock new regions on the map, on top of opening up new quests and, of course, moving the story forward. The breadth of the narrative in Assassin’s Creed Odyssey is made up of quests. There are reportedly over 300 missions to take on. 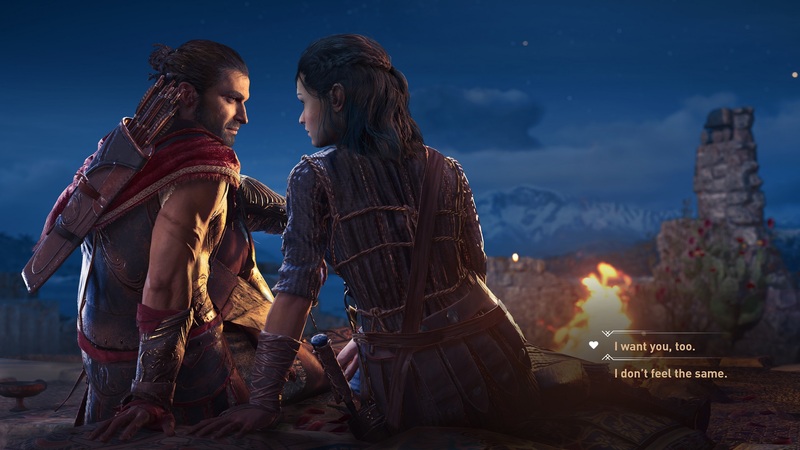 There are story quests, which focus on Alexios/Kassandra’s personal odyssey; world quests, which focus on locations, like clearing out a cave of bears, or sailing to a new land; character quests, where you perform tasks for the myriad NPCs in the game; and various timed quests, like daily and weekly missions. Some quests disappear if not accepted and completed as the story goes on, so for completists that have to do everything, it might be impossible here. One unique aspect I’ve come across is that quests don’t have to be completed in a way you might traditionally expect — let me explain. In one story quest, I had to track down and kill someone who did me wrong (staying vague here on purpose for spoilers), and I got through the first two parts of the quest before running into a wall. I went on to do another, unrelated mission, and the two converged into a new third mission, which also told me where I might find the guy I was seeking. Before tackling that mission — a military fort assault — I decided to explore a little more and unlock additional synch points. Lo and behold, I found my original target, hiding in a cave hundreds of meters away from the fort I was supposed to be assaulting. Needless to say, I promptly killed him. Doing so caused the previous quests to adjust the narrative on the fly to keep the story going without slipping into redundancy. I was very impressed with how seamless this was, as the story soldiered on without missing a beat. Assassin’s Creed Odyssey has added a new feature called Exploration Mode. Here, almost everything on the map is concealed in mystery until the player either comes across it naturally or discovers it from a conversation. As the name implies, this forces the player to explore every nook and cranny of every island to find every hidden location, treasure chest, bandit camp, and more. Even the synchronization points are obscured, meaning visits to new areas require some scouting before engaging in quests and plundering. I chose Exploration Mode for my playthrough, and admittedly, it can be a bit confusing not really knowing where to go next. It forced me to seek out all of the question marks on the map to manually unlock landmarks to open up the world. It changes the way I usually tackle an Assassin’s Creed game, and so far, I’m enjoying the focus on doing it all myself. For those wanting more of the classic Assassin’s Creed game experience, the Guided Mode highlights points of interest on the map, which cuts down on the fun and thrill of exploration, but moves the story forward faster. Again, your choice. The story is set in Greece in 431 BCE, during the Peloponnesian War. Athens and Sparta are in conflict for Greece, and the player influences one side over the other — or they can play both sides — by choices made throughout the story. This is done by completing quests that can weaken the opposing side. Attack enemy strongholds and burn supplies, or assassinate key officers to break the fighting spirit. Each completed quest drops the war strength of one side, culminating in a quest to take out the enemy leader. It’s fun to watch the leader’s security retinue drop with each mission, to the point that after tackling all the needed quests, you can easily find the leader alone, walking down the street; an easy stealth kill. Once the leader is killed, another new quest begins, the Conquest, which is a huge skirmish between the warring sides. The player is an active participant, and these epic battles are 150v150 — yes, 300 soldiers! — which recreate the absolute chaos of ancient combat. The player can engage with foot soldiers, or seek out commanders on the field to weaken the enemy’s resolve and turn the tide. This feels like something out of the Dynasty Warrior series, but executed with the artistry and skill of Ubisoft Quebec’s development teams. The character in Odyssey doesn’t use the classic assassin’s wrist blade, since the Brotherhood is still 400 years away from inception, but instead uses the tip of the Spear of Leonidas, the fabled Spartan leader made famous by the comic book and movie, 300. The spear tip works much like an assassin’s wrist blade, so the change is purely cosmetic, but kills aren’t always one-stab takedowns. Failing to pull off a stealth kill leads to combat. Players need to raise levels and skills to be able to pull off most kills, and failure to do so could be devastating. Depending on the skills you’ve unlocked, combat can be a challenge or a breeze. Once the Spartan Kick skill is unlocked, you may never go back to another move. It did not take long to completely fall in love with punting people all over Greece. It’s even better when you have the high ground on an enemy and then you kick them square in the face. I’ve booted people off cliffs, off of triremes, off of buildings, even down staircases. I’m like Lionel Messi, just booting everyone I can. Skills are broken down into three categories: Hunter, Warrior, and Assassin. Hunters rely on bows, warriors on melee, up-close combat, and assassins use stealth. Players can purchase skills in one category or spread it around, depending on your play style. Leveling up opens up the skill trees, and most skills can be upgraded up to three times. In addition to customizing which skills to unlock and learn, the gear system from Origins returns, as players can change armor sets by components, and Ubisoft has included plenty of options for headgear, chest, wrists, waist, and legs, all measured by rarity, common to epic. The character also has plenty of weapon choices, with various melee options and bows. There is a staggering amount of weapons and gear to choose from, and experimenting with what works best with your play style is the key to success. 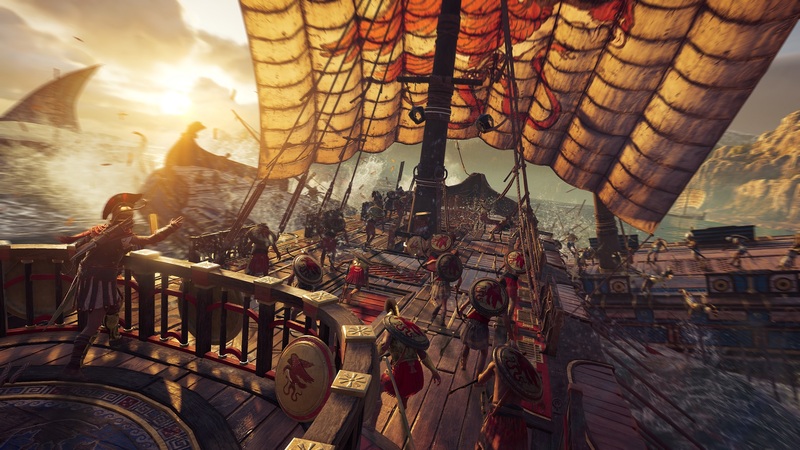 Naval combat in Assassin’s Creed Odyssey is greatly expanded from last year’s Origins and is on par with Black Flag for time spent on a trireme. In a country made up of various islands, sea travel in Greece is important, and Alexios has his own ship, the Adrestia. The ship can be upgraded, and staffed with lieutenants, which are enemies your recruit to your side by knocking them out instead of killing them. These lieutenants bring certain bonuses with them, like better bow damage or hull defense, and mixing and matching them to find what works best for you on your odyssey is another area of customization. The Adrestia sails the seas, engaging in combat with enemy ships and pirates, and so much more. Shanties return, as your crew will sing as they row, and the songs are all in Greek, which is a nice touch. Combat is old hat for anyone that played Black Flag or Rogue, with the biggest difference being the technology available at your disposal. Bows and javelins are the weapons of choice, and of course, you can ram ships, cleaving them in half and feeding your enemies to the sharks. Assassin’s Creed Odyssey looks absolutely stunning on Sony and Microsoft’s enhanced consoles. Unlike the deserts of Egypt, Greece has much more variety in its terrain, and many of the locales look photo realistic. Greek temples and statues are not always gleaming cathedrals to the pantheon of gods. They are lived in, messy structures, complete with weathered statues. The amount of detail at work here is staggering — I can’t tell you how many times I put down the controller just to soak it all in. The music and voice acting are both some of the best in the series. Accents are mostly Mediterranean, which helps sell the idea of this being ancient Greece. I particularly like the voice actor playing Alexios — his delivery is spot on every time. One quest, in particular, had me seeking out an ancient form of — ahem, viagra –for an older couple. The conversation tree during this exchange and Alexios’ delivery of those lines had me literally rolling in laughter. So much so that I had to stop playing to compose myself. Not since Black Flag has the voice acting in an Assassin’s Creed game been this good. Assassin’s Creed Odyssey, at its core, is an epic historical RPG that uses familiar assets, lore, and mechanics from the Assassin’s Creed universe. Of course, as the story progresses, more is revealed, and the merging of historical RPG and core Assassin’s Creed game comes to light — I won’t spoil any of that here, but believe me, it’s worth the wait. With 40-50 hours of gameplay for the main story and nine different endings based on the choices made throughout your personal odyssey, this is a game that can easily be played over and over for 400 hours or more, if you want to see everything the game has to offer. That is a staggering number for any franchise, and it really goes to show how epic this game is. And this is one epic game that will rule your life for months. It’s called Assassin’s Creed Odyssey for a reason, and much like Homer’s epic poem about Odysseus, it’s all about the character’s personal journey, and this year’s entry makes it personal in new and exciting ways. This review is based on the PlayStation 4 version of the game. A copy was provided by Ubisoft.